Stores and reproduces EDID information for a VGA display. The VGA EDID Emulator copies the EDID of the desired VGA display and connects directly to the VGA source to ensure that the EDID is not lost in connections between devices such as switches, splitters, and extenders. 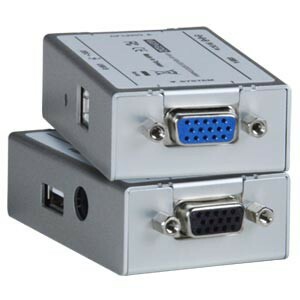 Use with NTI's VGA KVM switches, splitters, and extenders to ensure EDID data is provided to the source PC for optimal viewing on the remote display. Supports dual page DDC for compatible resolutions. Selectable default and cloned EDID data. Includes a USB pass-through port to connect one USB device to the female USB Type A port and use as if directly connected to the computer. Easy and compact design for installation and operation. Powered by USB connector or 5V power supply (not included). One black female 15-pin HD port for display connection. One blue female 15-pin HD port for source connection. One female USB Type A port for USB pass-through connection. One female USB Type B port for USB power. Optional 110 to 220 VAC at 50 or 60 Hz via 5VDC AC adapter (not included). WxDxH (in): 1.77x2.76x0.87 (45x70x22 mm). Combine NTI emulators and switches for complex applications.